Is it too late to give you my review of the iPhone X? No? Ok. Don’t mind if I do, then. I’ve owned my shiny, expensive toy for three months now. Today, it’s a little less shiny (both literally and figuratively), and I don’t marvel at Face ID everytime it performs its magic, so I figured this was finally the right time to share my thoughts. Plus, the majority of you probably still don’t own one yet, so maybe this will help you decide if the iPhone X is worthy of your hard-earned money in 2018. By now you know that I’m a geek when it comes to mobile phones. I love getting a new phone, setting it up, customizing the wallpapers and the settings, and learning all of the new features. But what you may NOT realize is that I was this way PRE smartphone too. Even in the “dumbphone” era, I was constantly looking for the latest and greatest device. I’d buy one, use it for a few months, and then sell it on eBay and start looking for something better. Huge weirdo. Between the years of 2005 and 2007 (right before the OG iPhone was released), I literally had ~20 different phones. It almost doesn’t sound possible, but it is not an exaggeration. I was definitely Verizon’s best (or most annoying?) customer. I could go on, but you get the idea. The iPhone was actually the best thing that could have happened to me (and my wallet) because it meant that I could only change phones about once a year. And there HAVE been stretches of time where I’ve kept an iPhone for longer than a year and not upgraded mid-cycle (i.e. I owned the iPhone 4 and 5, but not the 4S). Before I dive in, I will say upfront that the iPhone X isn’t perfect. But what device is?! As with any device, gadget, or technology, there are going to be things that bug you. Sometimes it’s because there are actual flaws/issues, and sometimes it’s simply a matter of personal preference. That said, I am not sure how much more we can expect from our phones at this point. Sharper screens? Thinner? Faster? More storage? Sure. But beyond that, what do we want or need these devices to do that they don’t do right now? I’d argue there isn’t much. I guess there’s always the promise of futuristic, Jetsons-esque features like hardware that bends, seamless integration with every other device we own, and the ability to drive our cars and watch our kids — but until then I think most of us are pretty satisfied. However, let’s be clear — none of this will stop me from upgrading every year or so — but that’s because I’m a sucker for shiny new things. We interact with and operate our phones by performing “gestures” on the touchscreen. iPhone gestures are things like pinching the screen to zoom in, or swiping right to go back to a previous screen. The iPhone X brings with it a whole new set of gestures to navigate through the phone and perform certain actions. This may seem daunting, but I can assure you that Apple nailed this. Outside of the new reachability gesture (which I’ll elaborate on below), everything else works beautifully. The new gestures are fluid, smooth, and feel incredibly natural. After literally three days I couldn’t remember NOT using my phone this way, and even for someone who is a little less comfortable with technology than I am (hey, Cody! ), it took less than a week. The best example of this is the new “swipe up” to go “Home” gesture. Because the iPhone X ditches the physical Home button found on every other model of the iPhone, Apple had to give us a way to get back to our home screens. So now, from any app or menu, all you have to do is swipe up from the bottom of the screen. They’ve even added an elegant little line at the button of the screen to guide your thumb to the perfect spot. It’s brilliant. Good riddance to the Home button. I promise you won’t miss it. Face ID was the big unknown. Before the iPhone X was released I read, listened, and watched content that questioned whether or not it would work well (or at all!). My feeling all along was that Apple wouldn’t release a product with this feature unless it flat-out WORKED. That’s just how Apple is. Other companies (ahem, Samsung) have released half-baked facial recognition functionality that has been less than stellar. But I felt that if Face ID didn’t work 99.9% of the time, Apple simply wouldn’t release it. These feelings were confirmed the first time I used Face ID. And then used it in the dark. And then with sunglasses on. And then with a hat on. You get the idea. Apple covered all the bases to perfection. I’m not here to explain to you exactly how the technology works (and I don’t think I could even if I wanted to), but it just works. Remember how amazing it felt the first time you were able to use your fingerprint to unlock your phone? Well after using Face ID for a week, you’ll wonder how you used Touch ID for so long. Face ID makes fingerprint scanning feel like a chore. It isn’t without a few annoyances, and I’ll highlight my biggest one in the “Dislike” section of this post. But generally, I have very few complaints. Some sunglasses don’t work because of the coating used on their lenses, but others work just fine. Surprisingly, my standard pair of Ray-Bans don’t work, but my polarized Oakley’s do. So you just have to experiment. I will most certainly be that person testing Face ID in Sunglass Hut when I buy my next pair. Bright, direct sunlight can also affect the sensor, but I liken that to Touch ID not working when you have wet fingertips. There’s almost always going to be a scenario that throws off technology like this, but it doesn’t make me love Face ID any less. I love, love, love the size of the iPhone X. The iPhone 7 felt a little small, and the iPhone 7+ felt ginormous. This device is the perfect compromise. It obviously depends on your hand size and personal preference, but I think the iPhone X’s size will appeal to (and delight!) almost everyone. I put this in the “likes” section instead of the “loves” section because I know no matter how stellar my new phone’s battery life is, over the course of a year of heavy usage it’s going to slowly get worse. I’m ok with this as long as it doesn’t take a nose-dive to the point where I have to carry a charger in my purse, so only time will tell with the iPhone X. So far it has been great though — three months in and I’m still averaging 10+ hours of usage on most days. The way the iPhone X handles notifications on the lock screen is delightful. If I haven’t used my phone for a couple of hours (let’s say, overnight), I will usually have a bunch of notifications waiting for me. I don’t know about you, but I like to take a quick glance at the list before diving in and looking at them individually. I was curious how the iPhone X would handle this, because ideally as soon as you LOOK at your phone it should unlock with Face ID. Well, Apple thought of this too! When your phone is locked, the headline of any unopened notification will show on the screen, but the details of the notification will not. For instance, you’ll see that you have three emails, but there will be no preview of the content of the individual messages. So if someone picked up your phone they would see that you have emails waiting to be looked at, but they wouldn’t be able to tell who they are from or anything about what they say. Once you look at the screen to unlock it with Face ID, it essentially expands the notifications for your eyes only so you can scroll through the list without actually going to your Home screen. And if you DO want to go to your Home screen, all you have to do is swipe up from the bottom of the screen. This nicely preserves your privacy without being annoying or burdensome. On other versions of the iPhone, when you’re on the Home screen you swipe up from the bottom to open the Control Center. This houses things like Bluetooth, wifi, brightness, the flashlight, etc. I use it constantly, and I’m sure many of you do too. Because swiping up from the bottom of the screen is now the iPhone X’s replacement for clicking the physical Home button, Apple had to move Control Center somewhere else. Unfortunately, they moved to a rather inconvenient location — the upper right-hand corner of the screen. Yep. It’s about as far away from where my thumb rests as it could possibly be. The only way I can get to it if I’m holding my phone in my normal position is to re-position my hand and balance it every-so-gently in my palm while I reeeach with my thumb. In Apple’s defense, there really just isn’t a great place for it. Every side and corner of the screen is being used for other gestures, so it was basically all they had left. Still, it’s annoying. As I mentioned above, Face ID is nearly flawless. It works 99% of the time, and when it works, you hardly notice what is actually happening. However, there is one scenario where Face ID drives me crazy — when my phone is laying flat at roughly the same level as my body (think: on your desk while you’re sitting or your bedside table while you’re laying down). Because of the location of the phone’s sensors (top of the screen near the selfie-camera lens), you can’t be looking at the screen at an angle less than ~75/80 degrees. This means that if I’m working at my computer and want to unlock my phone, I have to pick it up. The horror! #firstworldproblems. I know this sounds silly and like I’m the laziest person on earth, but after picking it up for the 5th time, it starts to get irritating. Whereas with Touch ID you could just place your finger on the Home button while your phone was still flat on the table, Face ID requires a little bit more effort. I also think it’s more dangerous. Even if you don’t text and drive — which I’m vehemently against, btw! — there ARE times when you’re in the car and you might need to pick up your phone (check GPS, take a phone call). Preferably you’re doing these things while stopped, but sometimes it’s just not possible. And when you have to unlock your phone with Face ID while moving, it requires you to take your eyes off of the road jussssst long enough to make you feel uncomfortable. Combine that with possibly having to remove sunglasses that aren’t Face ID friendly and you’ve got a situation that is very unsafe. So I’d like to see the ability to easily and quickly turn off Face ID temporarily. I know that goes against the movement to design features to prevent us from using our phones in the car altogether (which I am ALL FOR), but since most people are still going to use their phone while driving it should be as safe as it can be. There is the ability to disable Face ID’s “attention detection” — which means it will work even if your eyes aren’t open and looking at the screen — but to me that lessens the secureness of Face ID and it’s not something I want to turn off permanently. I went with the silver version of the iPhone X because I liked the white back and the stainless steel border around the edge of the phone. It reminded me of an old-school iPod! 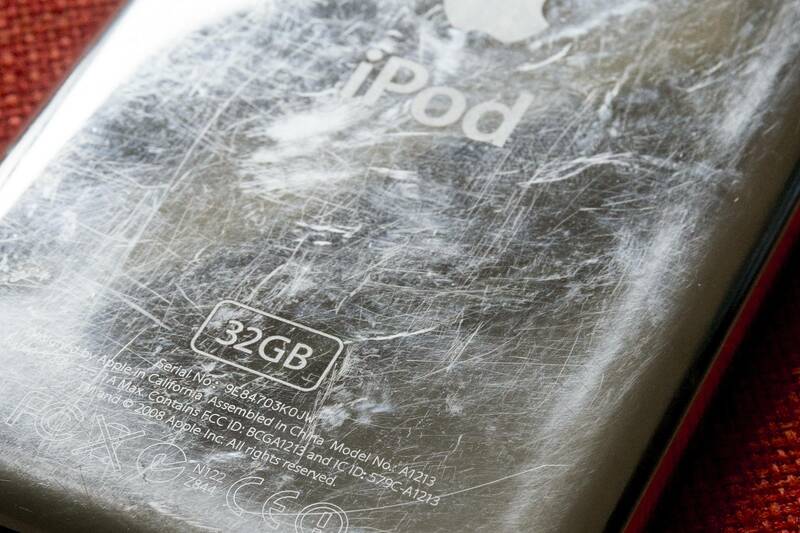 Unfortunately, it’s a little bit TOO much like an old-school iPod and the stainless steel easily picks up all sorts of scuffs and marks. Like freckles on old people (me included), they do kind of all blend together after a while and are really only obvious if you hold the phone at a certain angle and catch the light just right. Cody has the space gray (black) version, but he keeps a case on his. I image that version collects scratches and scuffs as well, but they may not be as visible. The glass on the back of my phone looks pristine though. I’ll also caveat this with — I’m a little obsessive when it comes to keeping my gadgets shiny and clean. I was the kid that made her friends wash their hands before they used my video game controllers, which surely helped me make tons of friends. So when it comes to my iPhone, I refuse to use a case, but I NEVER throw my naked phone into a purse or bag that contains other sharp, scratchy items without protecting it with some sort of pouch or cover first. I wipe it down with little eye-glass cloths every week or so, and I admittedly cringe every time I see a new scratch or scuff appear (at least for the first few months). Yes I know, I shouldn’t be “possessed by my possessions” as my Dad likes to tell me, but I can’t help it. I’m a neat freak and I like my toys (especially the obscenely expensive ones) to look new for as long as they possibly can. I handle my phone like it’s a fragile, living creature and yet somehow it still gathers scratches. So buyer beware. The “Notch” doesn’t bother me one bit! I don’t use my phone in landscape mode (holding it sideways) very often. If I’m watching video other than YouTube I’m usually on my iPad. Being able to tap the screen to wake it up is awesome! Closing apps you aren’t using is still very easy. There’s a nifty little gesture to bring up the app “tray” that displays all the apps you have open. Slide your thumb up from the bottom of the screen and pause for just a second. So clever and well done! You turn off your phone a little differently now. Holding down the single on/off button now activates Siri. So to turn your phone completely off you have to hold down one of the volume buttons AND the on/off button at the same time. Animojis are fun, but a bit gimmicky. They are animated emojis that use the Face ID camera to track your facial expressions — so if you raise your eyebrows in real life, your Animoji unicorn will too. Pretty neat. It’s also nice that you can send them to people without iPhone Xs. However, we’ve found that they require the perfect amount of lighting to work well. Cody and I sent them back and forth for the first couple of weeks that we had our new phones, but now we’re mostly back to regular old texts, Bitmojis, and GIFs. I love Portrait Mode but I honestly haven’t explored some of the newer options offered in the iPhone X’s camera menu (i.e. studio light, stage light). Every time I’ve quickly tried to use them, I can’t come close to replicating what they look like in the Apple commercials (shocking!). So I need to play around with this a little bit more. Apple Pay with Face ID works well — but it’s a slightly different process. You have to double tap the button on the right-hand side of the phone to activate Face ID. Same for buying apps in the App Store. I don’t find it as intuitive as placing my finger on the Home button (Touch ID), so it’s a minor adjustment. The new OLED screen is awesome, but unless you’re viewing an iPhone X and a LED-screen iPhone side-by-side, the average person wouldn’t notice the difference. The one small downside to the Notch is that it takes up space at the top of the phone where all of your phone’s status indicator icons used to be (i.e. battery icon, signal strength, time). Most of them are still visible, but the one thing that got squeezed out was the battery percentage. This was an optional setting anyway, but I liked it. Now if you want to see the battery percentage you have to open the Control Center. Another neat feature is the ability to flip through all of your currently opened apps without having to open up the app tray that I mentioned above. Instead, from the home screen (or from any app you are currently using) you can slide your finger to the right, across the bottom of the screen to scroll through your list of open apps. It works nicely — the only downside is that I forget the feature exists! With the removal of the physical Home button, the “reachability” gesture also had to change. Reachability dropped the content at the top of your screen about halfway down so you didn’t have to strain your thumb to access it (you used to double tap — not click — the Home button to make this happen). It was probably a little more useful on the Plus versions of the iPhone, but I used it from time to time. But now it’s basically unusable. I won’t even describe the gesture because frankly, I can’t ever get it to work properly. So that’s it! Despite some minor annoyances, this is the best iPhone I’ve used in a long time. The changes were just significant enough to truly make it feel like a “new” phone and sort of help justify spending $1,000+. But they weren’t so significant that there was a major learning curve. So what about you guys? Are you sold or not? Vote in the poll below and let me know! And if you have any other questions, I’m happy to answer them in the comments or in an update to this post! Need more TIRL in your life? I'd love to be your trusted go-to for all things tech! Sign up for my Tech in Real Life monthly newsletter and you'll get a recap of everything that was posted on the blog, plus other exclusive tech-related tidbits I think you might like! No spammy garbage. Ever.